Thanks to Vlad Tepes we have two videos about the ongoing political crisis in France centred around the Yellow Vest movement and the presidency of Emmanuel “Toy Boy” Macron. A lot has happened in France since Saturday January 5, when the Gilets Jaunes were out in force for Act VIII of their weekly protest. Yesterday, January 12, they were out again for Act IX. The first video above shows what many regard as proof of police brutality. It took place on January 5 in Toulon. A policeman (who they say is set to receive the legion d’honneur) is seen punching a man (an African) in the face. Later he is seen attacking GJ protesters. The African appears to be a passer-by since he is not wearing a yellow vest. In these demonstrations it is often hard to know with certainty what is going on. But we do see police spraying tear gas. The second video above shows the protest in Paris on January 12. In the lower right a GJ leader explains that Macron has to leave, that France is in a dictatorship, that the national debate is of no interest because nothing will come of it, that every five years there’s a debate and nothing ever changes. In this video the police are accused of excessive use of rubber bullets (flashballs). The third video is really a work of art. The smoky, foggy background, the determined confident people of a small city, the music (added, I believe, by the producer) are enough to make one feel like jumping in and protesting with them. From January 12, Bar-le-Duc, department of la Meuse, eastern France. The fourth video shows the city of Nîmes where storefronts, including banks, were smashed. January 12, Nîmes. Below, Dr. Steve Turley reveals the unraveling of Macron’s closest circle of advisers and the inevitable end of his concept of a global Europe. Below, Éric Drouet, mentioned in the video above, was arrested by Macron in December. Obviously, he is now out of custody and back on the front lines. 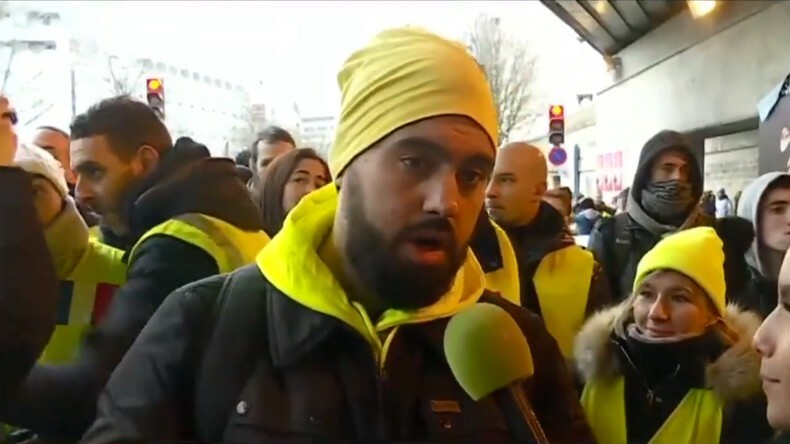 He has become a high-profile superstar of the Gilets Jaunes movement, something that could backfire, if he allows his fame to blind him to what is at stake in these demonstrations. A Communist politician, the flamboyant Jean-Luc Mélenchon, has expressed interest in Drouet. Let’s hope Drouet has no reciprocal interest in Mélenchon. I have read that some fear Communist infiltration into the Gilets Jaunes movement has already taken place, a very real possibility considering that the extreme left never misses a chance to disrupt and subvert any effort geared to nationalism, patriotism, and tradition.